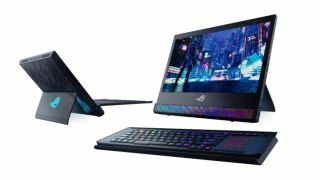 Asus has shown off its innovative Mothership GZ700 gaming laptop at CES 2019, the massive technology show that’s currently taking place in Las Vegas. While gaming laptops usually come in a rather limited range of form factors, either big and bulky, or thin, light and very expensive, Asus has done something very different with the Mothership GZ700. While it might not be for everyone, we’re excited to see such a radical departure from the norm. Unlike traditional laptops (gaming or otherwise), the components are placed behind the screen, not underneath the keyboard. This allows for better airflow to the hardware, keeping it cool while playing the latest games. The keyboard can either be used as if the Mothership GZ700 were a regular laptop, or detached, turning the Mothership GZ700 into a compact all-in-one PC. This new design has allowed Asus to pack the Mothership GZ700 with some pretty impressive tech, including an Nvidia GeForce RTX 2080 graphics card and an overclocked Intel Core i9-8950HK processor. It also has a series of super-fast NVMe SSDs set up in RAID 0 array, for even better performance, and gigabit networking as well. Thanks to its innovative design, the Mothership GZ700 uses air cooling, rather than water cooling as with some of Asus’ previous high-end and enthusiast gaming laptops, and it has allowed the company to reduce the size of the Mothership GZ700’s chassis to 29.9mm. We got to see the Mothership GZ700 up close, and we have to say we’re impressed with what we saw. While it can’t be used on a lap and will instead need to be confined to a desk, that’s also true of many other gaming laptops that are too heavy – and too reliant on a power supply – to be truly mobile. If you think of it more as a very powerful gaming-orientated all-in-one PC that can be carried around with you, then you’ll probably be just as impressed. We don’t have any firm release date or price, but Asus tells us it will be available at some point in Q1 2019. Hopefully we’ll get our hands on a review sample soon.